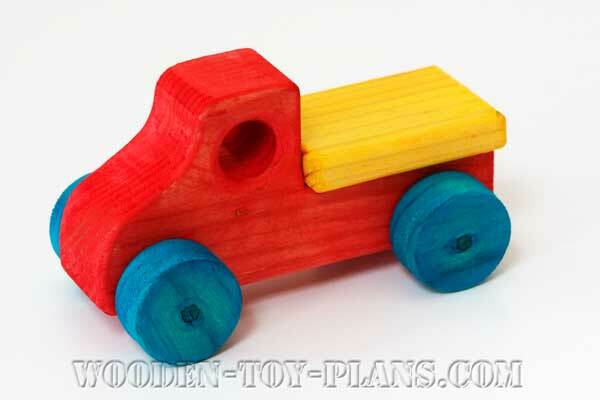 Use these wood toy truck plans to make something with pride and joy because handmade wooden toys are always appreciated so much more than a mass produced product. 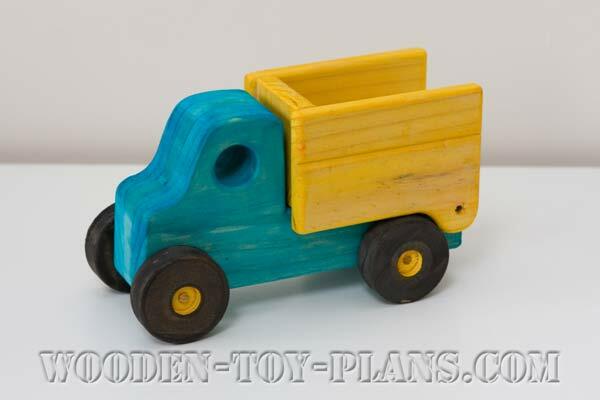 Wooden toy trucks are a perennial favorite among children of all ages. Any truck made from these plans will be unique and treasured for generations to come. It will be time well spent, and your greatest reward will be their everlasting appreciation. 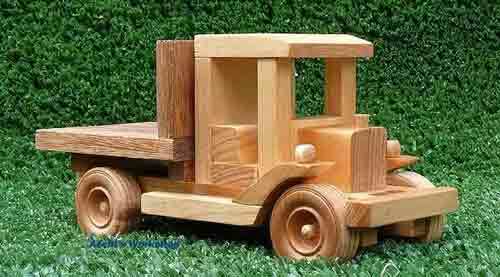 Regardless of the advances in technology, there will always be a special place in the hearts of children for handmade wooden toys. This is one of the reasons why making wooden toys is such a popular pastime. Get a load of the next big toy! Whether it is gravel, sand, dirt or debris, this table top truck is built to haul it. The tailgate swings open when the dump box is lifted. A support underneath allows the box to be held in the dump position. 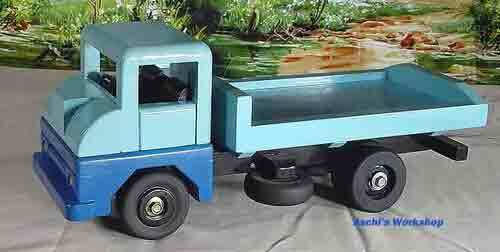 This is the most recent in the series of nine Construction Grade fleet of models. 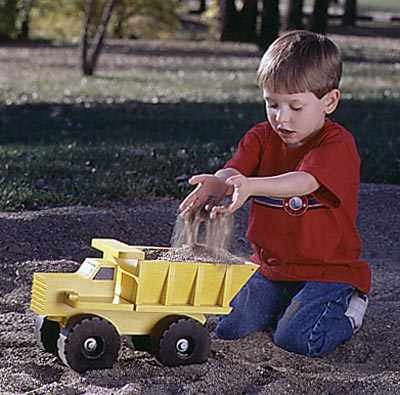 Modeled after the earthmoving monsters that roam large building sites, this sturdy toy truck makes moving lots of sand childs play for young construction hands. 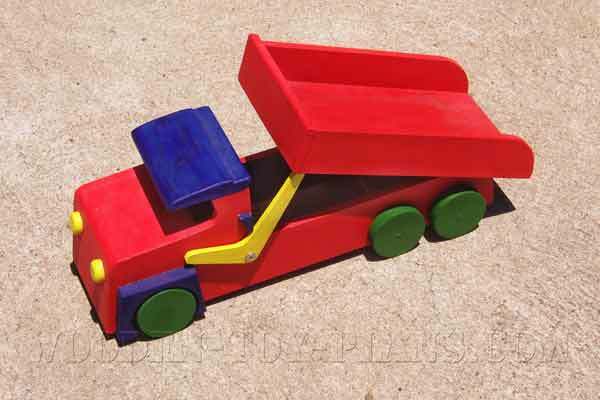 We built our dump truck from 1/2 inch thick pine, laminating material for the thicker parts. You can resaw and plane pine boards from the lumberyard or home center for the needed stock. 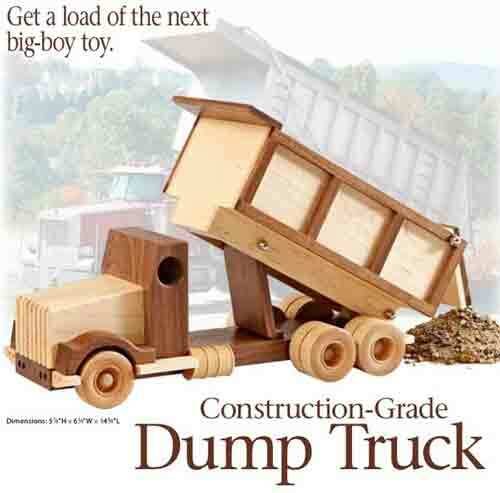 A 1×8 and a 1×6, each 6 feet long, will provide more than enough material for one dump truck. A popular pickup truck modeled from vehicles on the 1920s and 1930s era. Enclosed cabin, big fenders and a bumper bar were common features. We designed our model to be built in 4 easy stages resulting in a sturdy toy. An ideal scrap wood project! The greatest time for heavy truck movers was during the 1930s. Big fenders. Big headlights. Big engines. Our model is a classic design from this era. The plan is divided into three groups, cabin, chassis and motor. 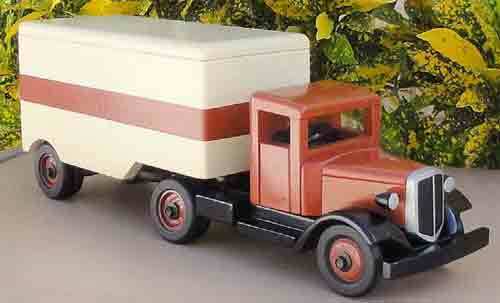 The freight truck was designed in the 1960s in England and was successfully sold and used throughout the world. We designed our model to be built in 5 easy stages. 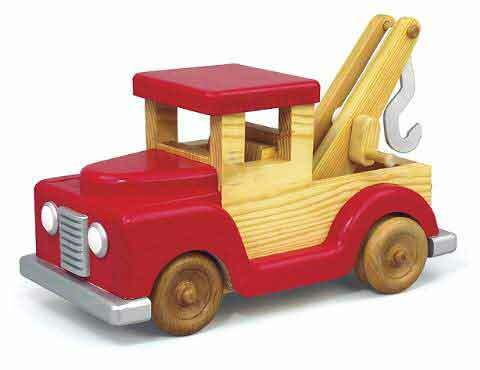 Children are sure to love our new tow truck with a working crank and tow hook! Build it from 3/4 inch pine. All patterns drawn FULL size. 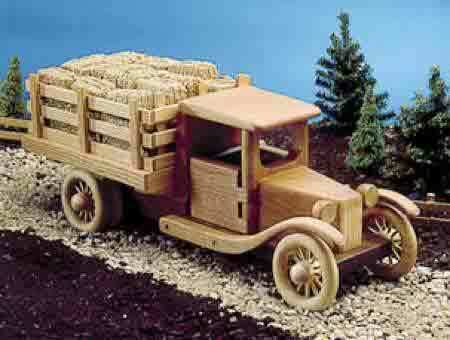 Wood toy truck plans for a collectors edition farm truck, designed by professional toymaker Steve Baldwin of Omaha, Nebraska, this hardworking little truck pleases children and adults alike. And thanks to the full-size patterns for many of the parts, it goes together faster than you might imagine. 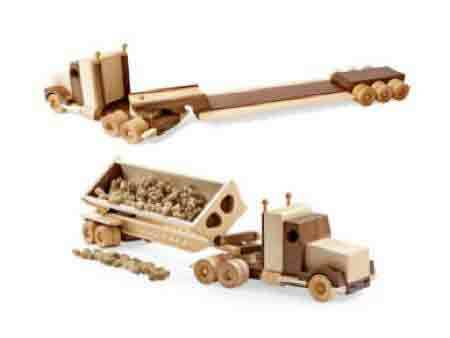 Go ahead, order these wood toy truck plans and give it a try. You can almost smell the diesel as these big rigs muscle their loads to the job site. 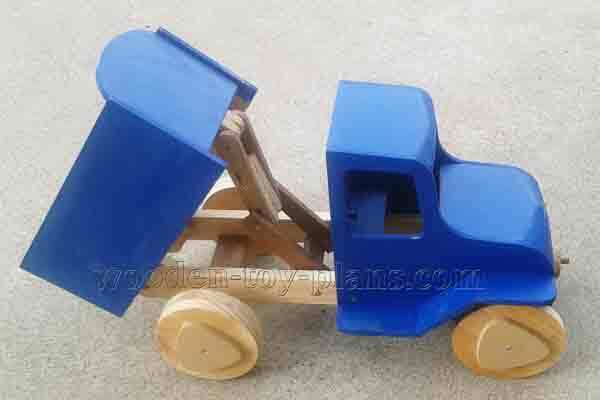 Here we present these wooden toy truck plans for a tractor, followed by two trailers: a side-dump, as well as a lowboy for transporting equipment. Did you know that in the United Kingdom and Ireland a truck is also known as a lorry? The name probably derives from a horse drawn low loading trolley from days gone by. Red lorry, yellow lorry - how fast can you say that over and over again? 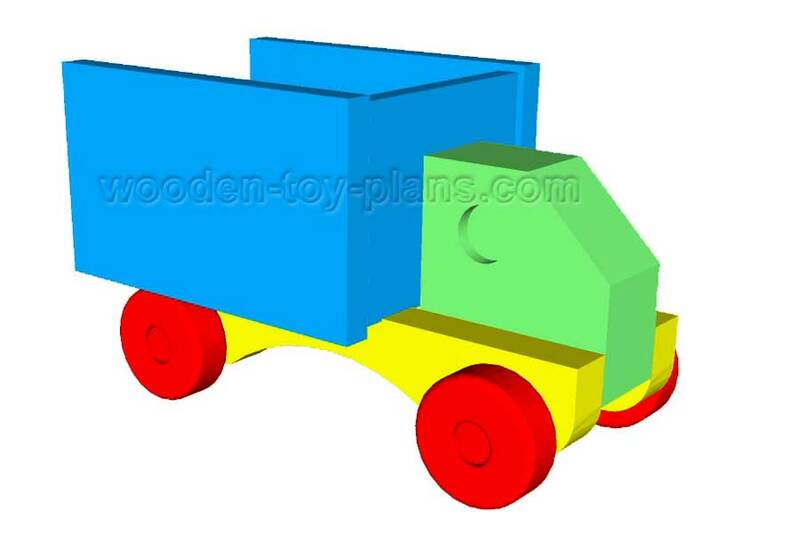 Free wood toy truck plans print ready PDF complete with step by step instructions. Simple rugged construction anyone can make. 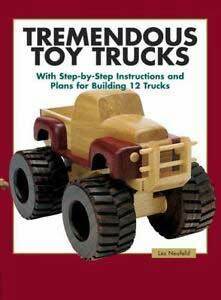 Tremendous toy trucks a book by Les Neufeld for sale at Ebay. Functional and realistic without being fussy, these toy trucks boast wheels that roll, buckets that lift, and winches that pull.